What I used: Coastal Scents 88 Ultra Shimmer Palette : Pink & Royal Blue on the lid; Black on the outer "V"; Royal Blue under the lower lash line--I rarely use the shimmer palette because I always find it difficult wearing shimmery shadows all over, especially in the daytime. After getting the bangs, however, I feel like I can pull off any shadow texture or combo! 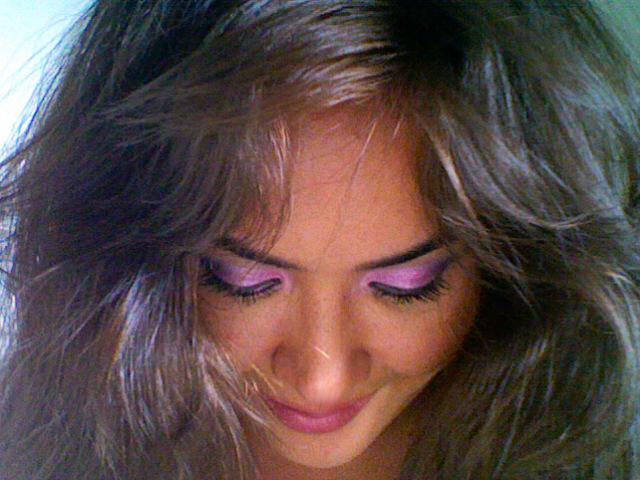 I played the look somewhat down by lining my eyes with a purple liner instead of black. I used Maybelline gel liner in Eggplant. 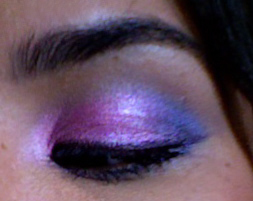 Apply the pink shadow on the inner half of your lid and tear duct using patting motions. 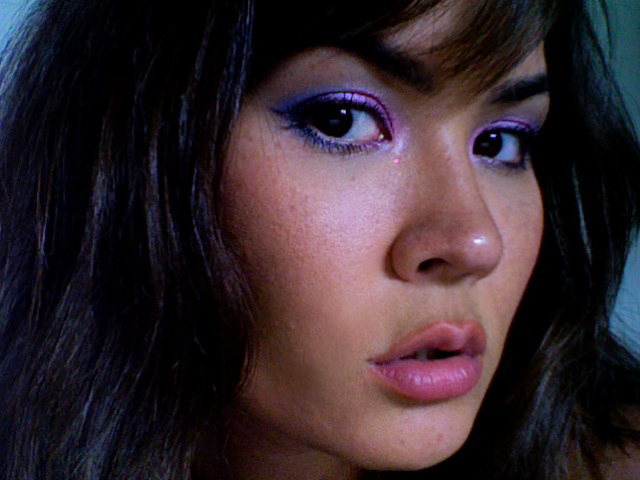 TIP: Shimmery shadows tend to have a lot of fallout so it's a good idea to place a tissue under the eye to catch it. 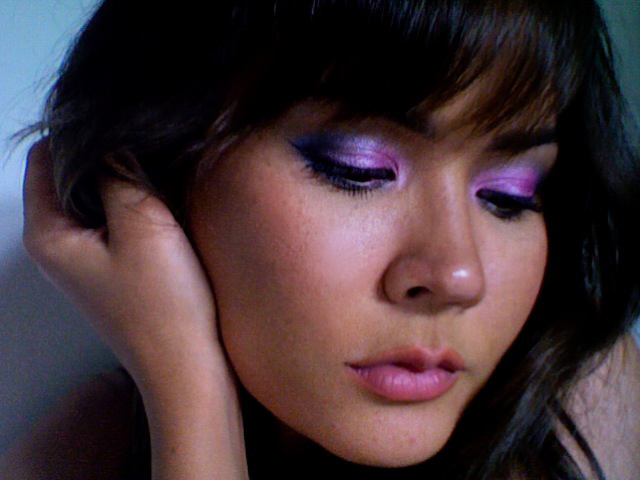 Using a clean round fluffy brush, blend out the harsh edge of the pink and purple to make it fade into your skin. TIP: To make the transition more natural, use a matte brown shadow that is a couple of shades darker than your skin tone. Using a black shadow on a pencil brush, outline the outer "v" of the lid for extra definition and drama. TIP: On asian eyes, outlining the outer "v" helps to "fake" a crease. You look beautiful as always!!!!! omg thats who you remind me of.... apollonia 6 with this eye make up and your hair your so gorgeous... if i believed in girl crushes you'd be mine along with amber rose but your the better looking one... lol! So bright and pretty! Great job! i really love this one! beautiful! Love love love!!! Looking at your stunning creations, I am having a strong desire to open another blog.. just for do arty makeup! Hi Maryam.You look so beautiful as usual. Your hair is just perfect. Meanwhile, Inessa Nazarova was crowned Miss Eurasia 2011 at the finale held in the city of Antalya on June 4th. Please check the photos..
Mintimer häm Säqinä Şäymievlär altın tuyların bilğeläp ütä. Mintimer häm Säqinä Şäymievlär ğailä qorıp yaşäülärenä 50 el bulunı bilğeläp ütqändä, Tatarstanda 42 par niqaxların terqäyaçäq. This is such a pretty look on you and the purple is so fun. Your bangs are so cute and chic too. Love the color, you are pretty! love the colors on you! I don't think I could pull it off :/; New follower! Beautiful! The colors look great on you!